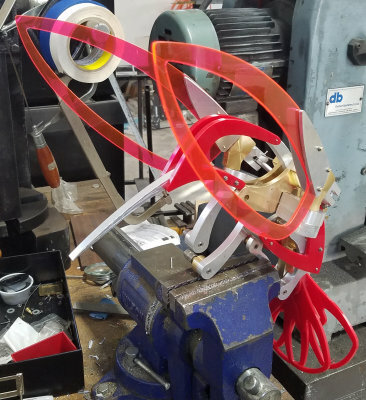 Although the assembly instructions show assembling the "bird parts" to the frame as a series of steps, once they are all in place it's clear they can be removed and installed as a single unit by removing the spinners and the shaft they turn on. I was having issues with the cams getting out of sync, so with only the frame and cams it's much each to try to get them straight. Part of the problem seems to be the rods that connect the gears to the eccentrics. I made them from drill rod, and it seems that the inside is soft enough that the grub screws deform the flats and allow things to wobble. The plans call for 303 stainless, and according to McMaster's order history I should have some, but in fact it's nowhere to be found. Shop elves? So I ordered another foot plus a replacement roller bearing bearing, and will get back on it when they arrive tomorrow. In the meantime I still need a bit of fettling on the wings to free up the rotation. Absolutely gorgeous! My friend and I bought the drawings when we first found out about it. He finished his in various woods and has a video of it on Youtube. Me on the other hand have had so many projects that I haven't gotten around to this one yet. He runs his with a small gear head motor driving the hand crank mechanism. - The counterweight balances the entire pivoting assembly at the top of its rise. So the bottom cam will have some force at the low points that will decrease as the assembly rises. That may not be as much of an issue as I feared, and can be tested before putting Colibri on a severe diet. - The cam for the head has a quite small range of motion and only moves the head up and down, so that isn't an issue. 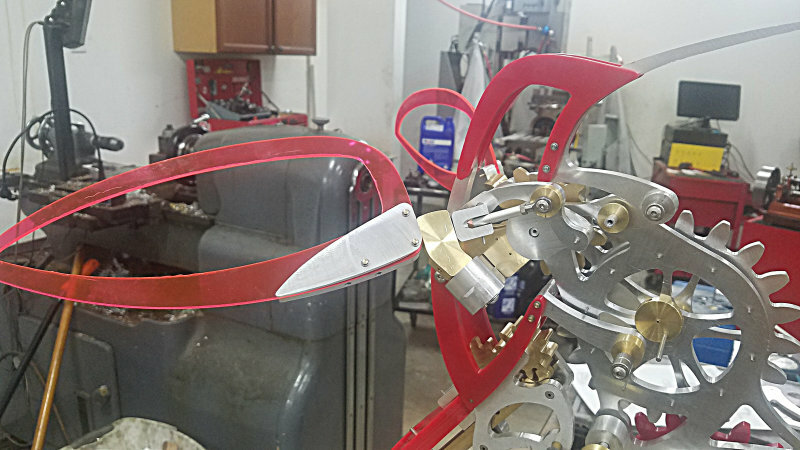 - The cams wheel for the body and tail work together, since the tail is connected to the body, and both need to resist the tail's weight as it pivots. The tail cam follower especially has the cam quite far from the tail so that the lever arm is long. Plus the cam itself has two quite sharp ramps that the follower must climb. This leads me to believe that I'll need to reduce the mass of the tail assembly. The brass rack and gear could be changed to lighter material, so that may be the path to take if it proves necessary. With regard to checking the weights balance, I decided to create a temporary counterweight to verify my theories. To that aim I started doing some internet searches for lead shot. Not surprisingly, on eBay the shipping costs for lead can be high. I discovered that one of the ways to buy it is as scuba weight bags, a mesh bag filled with shot. I checked locally, and I can get a 5lb bag for about $25, so that's my plan. The way the instructions state for creating the counterweight is to suspend a jar from the counterweight flange by a string and fill the jar with shot (or bbs) until Colibri is balanced, then weigh the jar and shot. Should make it easy to experiment. Another local source for lead shot is the sporting goods store, they sell bags of shot for reloading shotgun shells, though its usually in large bags. Or, musket balls in the black powder section, come in boxes of 50 usually. Either can be melted down and poured into ingot form to save space. For my clock weight tubes, got a bunch of leftovers from a friend who casts bullets, he had some lead that was a bad alloy. Used to be able to get used wheel weights, but those are going to stick on steel. On ebay you can get big boxes of the steel weights for verh little money. We use them for submarine ballast. Anyway, bird is looking great! Do the cam followers have ball bearings on them to reduce friction? 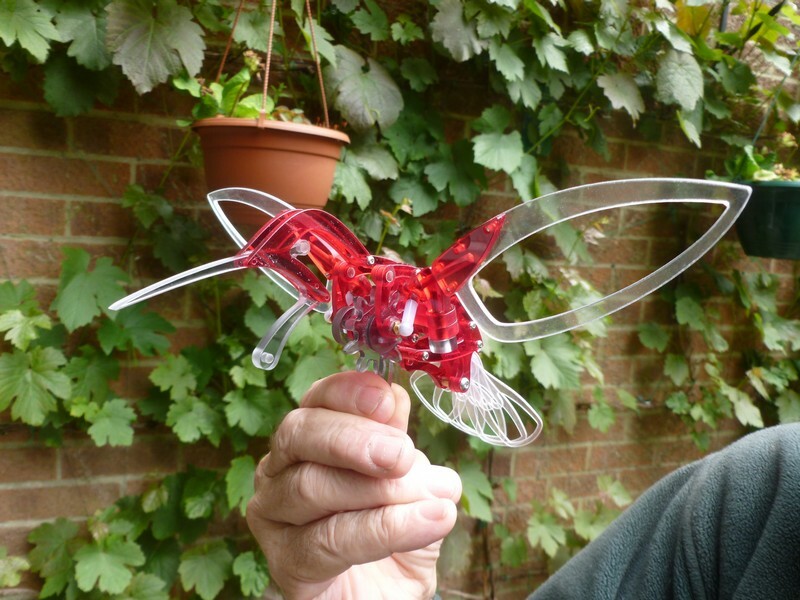 Hi Kirk, After your 'bird on a vise' here is my Petite Colibri 'a bird in the hand' If you look closely, I have added an eye. Now you are getting to the really exciting part. Another local source for lead shot is the sporting goods store, they sell bags of shot for reloading shotgun shells, though its usually in large bags. Also, bird shot is amazingly uniform in weight. You can construct precise weights by establishing an average weight and then just counting shot to get to a predetermined weight. I went to the dive shop this morning and purchased 3 bags of shot - 5, 3, and 2 pounds. I mounted the bird back on the frame and placed a small plastic bucket over the counterweight arm. The balance point is between 5 and 7 pounds as the 5 pound bag didn't tip Colibri over, and the 5+2 bags did. Even with just the 5 pound bag the effort to do a complete cycle of the lower cam wasn't too high, so that's encouraging. I had left a good bit of the mechanism off for this test pending delivery from McMaster this afternoon. Doing some rough calculations, a 6 pound lead counterweight in a 2.5" diameter round bar (size of flange) would be about 3" long, so not unreasonable. Still following along. I wouldn't have thought of diving weights but I did give my uncle two bags of lead shot that I figured he'd use in his black powder guns. They were in the house when we bought it. Today I added the wing "arcs" to the spinnders, and attached the heim joints to the arch. The enabled me to check out the wing motion without any other part of the mechanism engaged. I found a few sticky spots, and some misalignment due to some sizing of a couple of spacers. But otherwise the wings do move in an interesting manner. Then I remade the axle for the top gear and wanted to try the cam followers for the head and tail. The head cam, as expected, has very little motion by itself and doesn't seem to present any issues. When I installed the followers for all three cams together I got resistance. Back to individual followers, I found that the tail cam by itself works well enough that the weight of the tail isn't as big an issue as I expected. I could turn the input gear and drive the tail through its cycle without excessive force. I did notice that there's the same issue as with the wooden version in that the follower doesn't fall down as the cam would lower it; in other words, the bearing loses contact with the cam. Hugger suggests adding a small weight to the inside of the follower near the "head". When I applied a bit of weight with my hand, it seemed that the follower action was jerky as the bearing essentially falls onto the cam surface. I need to order some screws to complete the flower assembly , but did mount the stem. After a few adjustments and reassembly, I tested the counterweight again with the scuba weights. At 8 pounds things seemed decent (i.e., I could crank through the cycle by hand without too much torque needed) and at 10 pounds Colibri tipped over. I had contacted Mars Industries about a sash weight, but they replied that they have a $500 minimum order. Then I found RotoMetals who sell round lead disks. I ordered 3 disks 3" diameter by 1" thick (2.89 lbs each). I'll skim turn these on the lathe and join with a long 8-32 screw through a center hole. Now waiting on some screws from AME to finish off the flower. I'm also going to try running it via a battery powered screwdriver I have that may be slow enough with enough torque. I'll need to whip up a coupler. Bad Behavior has blocked 16375 access attempts in the last 7 days. Page created in 0.218 seconds with 20 queries.